This was without doubt, the best pastry I have ever made. EVER! I had the same issue as a lot of others with my mix being quite dry and crumbly but after its rest it came together beautifully. And it was even delicious raw, I kept snagging pieces as I worked. We were in the midst of moving furniture the day I made these so while I made a full batch of dough, I only rolled 4 turnovers plus a mini apple pie and froze the rest. I got a little impatient with the rolling out (ie. my arms got sore). So I cut out 3" rounds from the dough and rolled each one out to 4 1/2" individually. Much easier! Fantastic! This was the pastry so many recipes had promised but none had ever delivered. Crisp, flaky and delicious. 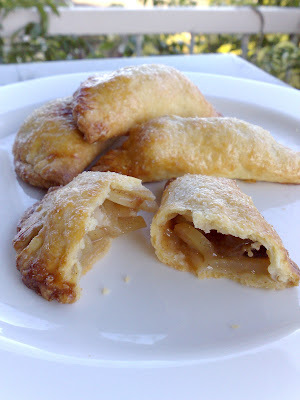 I used a mixture of fuji apples, slivered almonds and raisins to fill these but you really could use anything you liked. The perfect afternoon or anytime treat. I think this will be my go-to pastry from now on. Thanks Jules! Yeah! So glad this worked out for you! Those look just amazing! Thanks for baking with me! Your turnovers look lovely. Nice and flaky. Next time I'll add raisins and almonds. that sounds delicious. Wow, those look gorgeous! Makes me wish I hadn't wimped out and had actually made the dough - so flaky and brown and delicious! Your turnovers look great!!! The dough really is amazing....glad to see someone else was eating it raw as well! Brilliant job Susan - I love the addition of the raisins and the almonds to the filling. Tell me about the sore arms - my right arm is still sore today, and I made these on Sunday. Even with the dough issues they turned out wonderful for you! I really liked this recipe and hope to make them again soon! So glad it came together well for you, my dough was a pain. The look lovely! they look delicious. Nice and brown and full of apple. 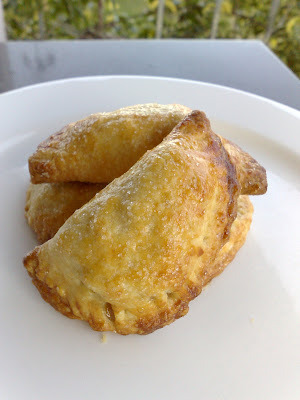 nice recipe, is it the same with empanada? it's so flaky and full of flavor inside..thanks for sharing.